Our 85th theme for #FoodieMonday#Bloghop group is #Nigellaseeds. Nigella seeds, kalonji, black cumin, balck caraway,fennel flower,charnushka, onion seeds, Roman Coriander as they are called taste like a cross between onion, oregano and black pepper. It however has no relation to onion, cumin, fennel or caraway. They are seeds from the plant Nigella Sativa.Its widely used by the Indian Subcontinent and the Middle East including Turkey. Nigella seeds are roasted and ground and used in curries, vegetable preparations. As whole seeds they are used in pickles, flat breads and other breads. Use the roasted seeds in salads, sprinkle them on egg dishes, add a few seeds to relishes or chutneys. The famous panch phoran spice mixture from Bengal is a mixture of kalonji, fennel, cumin, fenugreek and mustard. Goes well with cheese dishes or cheese breads. I have tasted a cheese and nigella bagel and the earthy, slightly pungent taste complimented the cheese taste perfectly. How do you distinguish the black sesame seeds from nigella seeds? Well besides the taste its the shape of the seeds. Black sesame seeds are oval and nigella seeds are triangular in shape. I once made the mistake of topping a preparation with nigella seeds instead of sesame seeds (both stored in same type of jars!). Its only after tasting the preparation I realized my mistake. However, the nigella seeds added an interesting flavour to the dish. Nigella seeds has various health benefits. Nigella oil mixed with lemon juice fights acne, ground nigella seeds mixed with honey aids memory, nigella seed oil if rubbed on the forehead gets rid of headaches, ahandful of nigella seeds heated with mustard oil, cooled and applied on joints prevents inflammation of the joints.Add nigella seeds to boiling water and breathe in the steam to reduce nasal congestion. 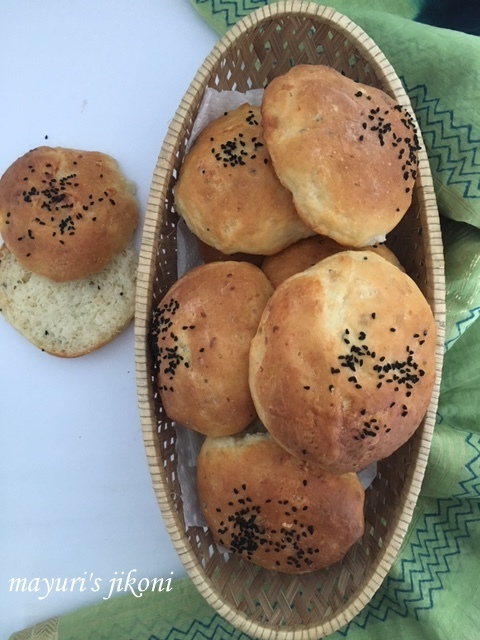 I decided to make Turkish Kahvalti Buns using nigella seeds. Turkish breakfast is called Kahvalti. The word derives from ‘Kahve Alti’ which means under coffee or before coffee. Traditional Kahve is not drunk during breakfast. Its usually consumed after breakfast or in the afternoon. Traditional black brewed tea is served with breakfast. Turkish breakfast or Kahvalti is an elaborated meal usually enjoyed as a family.A typical Turkish breakfast may include black tea, white cheeses, boiled or scrambled eggs, olives, tomatoes, cucumber,spicy cheese, Turkish sausage, grape or mulberry molasses, jams, honey, helva, butter, omelette called menemen and breads. Breads can be flat or normal. Turkish Kahvalti Buns have crumbled or grated feta cheese, mashed potato and nigella seeds added to the dough. Some more seeds are then sprinkled on top before baking. These buns tasted delicious… the saltiness from the feta, the onion herb like taste from the seeds and the softness due to the potato. Hubby and I enjoyed the buns with an omelette but go ahead and enjoy the buns on its own with some tea or coffee. Add the flour into a mixing bowl. Make a deep well. Add the yeast into the well. Add milk.Cover the well with flour. Cover the bowl and let the mixture rest for 1 hour. Add salt, mashed potato, oil and nigella seeds. Mix and bring the dough together. Lightly flour the worktop. Knead the dough for 10 minutes until it is smooth and silky. Put the dough into the greased bowl. Cover it with a wet tea towel or cling film and let the dough rest for 20 minutes. Lightly flour the worktop and tip the dough out. Flatten it gently with your palm. Add the feta cheese and knead it gently. Shape the dough into a round ball. Put it back into the mixing bowl. Cover the bowl. Let the dough rise till its double the size or for 1½ – 2 hours. On a lightly flour worktop, deflate the dough gently. Divide it into 12 parts. Roll each part into a ball. Shape each ball well and place it on a parchment lined or greased baking tray. Let the buns rest for 45-50 minutes. Brush the tops gently with milk. Sprinkle nigella seeds over the buns. Bake in the oven for 25-30 minutes till the tops are golden brown. Remove the buns from the oven and cool them on a wire rack. Serve with breakfast or with tea or coffee. I like adding seeds to the bread as that way one gets to eat most of them as opposed to them falling off the top. You can glaze the top of the buns with egg wash before baking. Try and leave some feta cheese as pieces in the dough. It tastes yummy when you get that occasional feta cheese bit in the bread. These buns are screaming “eat me”..yumm! Your bakes are always a delight to the eyes..these Turkish buns with nigella look so inviting. Perfect breakfast and looks delicious Mayuri. Thanks for sharing. Love these yummy buns .Perfect breakfast idea. Thank you Nisa, the potato makes the bread soft. Trust me Pushpita, with feta and potato taste, it was really tasty. ANd not to forget the earthy oniony taste of the nigella seeds. Actually for any time of the day Rupal. Hubby and I had it with masala tea as a tea time snack. Thanks Sujata and you're welcome.